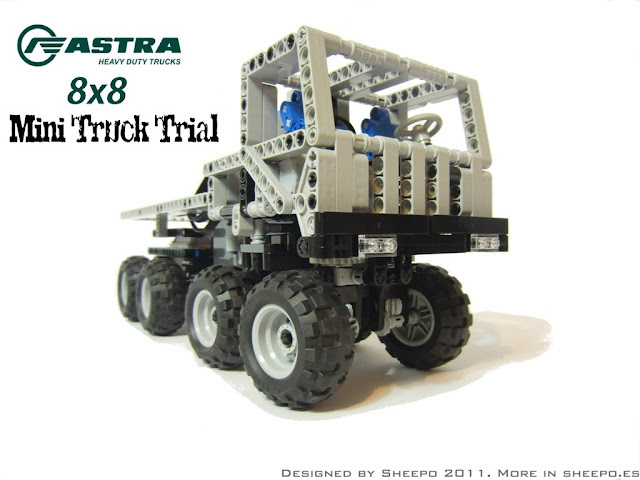 Astra 8x8 Mini Truck Trial. Now with instructions!! This mini truck trial was built two months ago for a local competition(finally I can not assist :( ). The most important rule was the widht limit: only 14 studs. Due to demand in events for GBC circuits, it could be a great idea bring back this balls. Bricklink prices are horrible for large quantities, and new GBC builders don't have chance to have them for his first module. I'm sure AFOL and TFOL even will pay for a set with a standard pack for a GBC module. Even if TLC consider produce it in new colors and moulds it will be awsone rainbow coloured modules or mindstorms NXT colour sensor.